Since The Lego Movie was such an awesome movie, I wanted to talk about spoilers. So, if you have not seen The Lego Movie, be sure to go watch the movie right now and then come back to review and comment. Also, if you are still not convinced, click here to read my review for the film. How many movies are you going to see that features Batman, Gandalf, Han Solo, Dumbledore, TMNT, and Shaquille O'Neal in the same movie? Seriously, outside of fanfic, The Lego Movie is the only place where any of these things can happen. 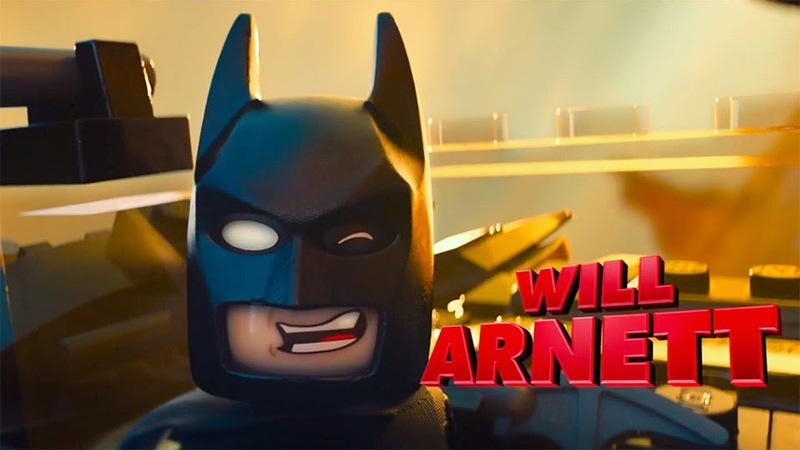 Interestingly, Warners Bros, the company behind the Lego Movie, is the productions studio behind the Hobbit, Harry Potter, and DC, so getting those franchises is not particularly difficult. However, Star Wars, Teenage Mutant Ninja Turtles, and a few others are not disturbed by Warner Bros, so I am interested in how they were able to get the rights to use all of those franchises. Even though Lego itself has the rights to the toys, that is entirely different than film rights to the characters, even if they are in toy form. In future films, maybe the Lord of the Rings and Harry Potter will play a larger role, maybe with Harry Potter or Bilbo being a main character instead of just Batman. My favorite and most unexpected part of the entire movie is when the Millennium Falcon just appears out of nowhere! Even though Star Wars is Lego's most successful and popular franchise, Disney owns Star Wars and Disney also knows Marvel, and Warner Bros and DC are their rivals, granted, DC has been kind of a pushover lately. Maybe the deal to use Star Wars was made before Disney bought Star Wars. Either way, getting to hear Billy Dee Williams and Anthony Daniels reprise their roles as Lando and C3PO was so awesome! Keith Ferguson voiced Han Solo, and he has voiced Han in Robot Chicken and MadTV's parodies in the past, so he did a fine job in the brief role. The classic Star Wars music was even used! I might even go as far to say that this is the best Star Wars reference/crossover in any film. Another awesome part of the cameo is that it actually plays an important part of the story! 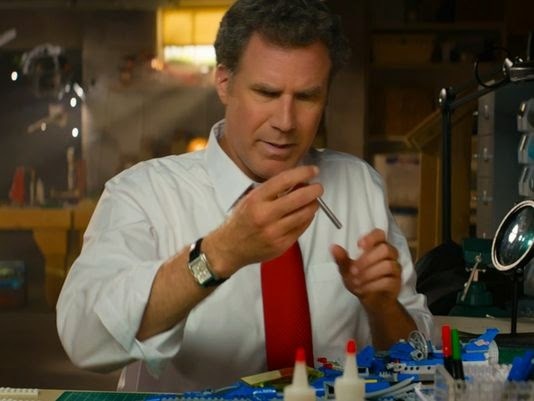 Despite the movie referencing "The Man Upstairs" with a human hand, I thought it was only humorous way to reference how the Legos were created by people. To my utter shock, however, "The Man Upstairs" is actually Will Ferrell's character in live-action! Thankfully the twist was never hinted at or spoiled since the film's release. In my review, you may remember me referring to a theme that I disagreed with and that is how the movie was almost against model builders. It was not trying to be offensive and I ultimately did not care that much, but it was still kind of odd considering that most of the adult Lego fanbase that create the awesome things for Legoland and such do use glue and such. Speaking of glue, the use of nail polish, glue, and the "Exact 0 Knife" was hilariously clever! 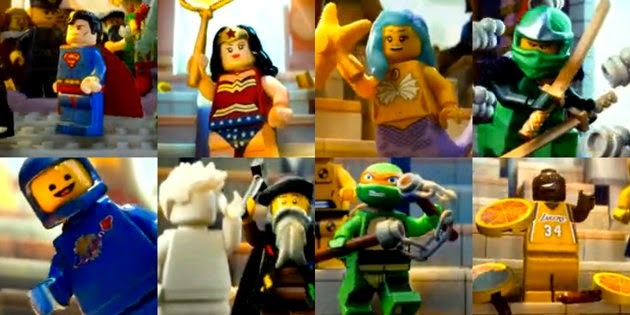 Two years before DC's trinity finally hits theaters, The Lego Movie beats them to the punch with Wonder Woman's first theatrical appearance. Oddly enough, she is voiced by Cobie Smulders, who is known for her role in the Marvel franchise as Agent Hill, so she is yet another actor to play both a Marvel and DC character. Another Marvel/DC crossover is Channing Tatum as Superman, who will now be playing Gambit in the X-Men films. Another fun fact is that Green Lantern is voiced by Jonah Hill, and the directors of the Lego Movie are same ones that directed 21 Jump Street, so we basically have a 21 Jump Street reunion with Lord, Miller, Tatum, and Hill. Despite not being voiced by their live-action actors, two master wizards, Gandalf and Dumbledore, make a brief appearance as Vitruvius mistakes Gandalf for Dumbledore and then mispronounces Dumbledore's name. For the first time, Lord of the Rings and Harry Potter have an official crossover! Also, one of the realms is called "Middle Zealand," which is an obvious on Middle Earth from the Lord of the Rings, which is filmed in New Zealand. "He's the hero you deserve"
Towards the end of the movie, Batman tells Wyldstyle "He's the hero you deserve," of course referring to Emmet. If anyone is familiar with Nolan's Dark Knight Trilogy, this is kind of a reference to Gordon's line "Because he's the hero Gotham deserves, but not the one it needs right now." Also, Bad/Good Cop is voiced by Liam Neeson, who played the main antagonist in Batman Begins, so when Batman fights Bad Cop it is almost like a meta reunion. If anyone is interested, I might write a post about what I want to see in the sequel? Please comment below and let me know.